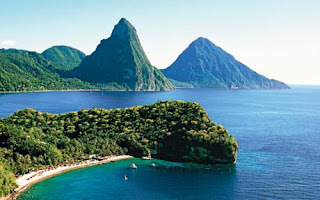 Saint Lucia is an island country in the eastern Caribbean Sea. This is a fertile place with many natural wonders that will amaze for anyone who comes to visit. This beautiful island is also located at the tip of a volcano hot springs in various parts of the island. One of the reasons why this is so fertile island can be seen from the composition of the volcano, and two well-known peak called Pitons. If you want to visit Saint Lucia and see the famous landmark Pitons, you can stay at Tranquil villa located in the hills north of Soufriere, along the west coast. This villa is perfect for a refreshing feel and relaxed atmosphere. From this place, you can see the Pitons view that is unmatched. When the sun sets, lunch, dinner and even when the tropical rains, these moments will produce a unique effect. Tranquil Villa does offer a great view that is second to none, but a new experience begins when you set foot out of the villa. By having access to a car and a map, is enough for you to explore the island. However, it must be remembered trip around the island will pass through a steep path and is a bit dangerous. You never know what could come around the corner. Being in Saint Lucia, you have to visit a seaside resort on the beautiful, called Ti-Kaye. To get there, you have to go through winding roads and steep. Travel to the resort can be guided by the people of the place you stay. In addition to line the hills and beautiful beaches, Saint Lucia is also filled with natural hot springs. Along the guide, you can asked to be taken to the baths New Jrusalem, tourists are not widely known and kept secret by the locals. After a journey through the most remote, untouched and steep, you will reach the location of these baths. During the walk to the baths, such as if you have an adventure in the woods. The bath itself is still very natural.